I grew up in Michigan, and my childhood memories of Father’s Day are of being at Michigan International Speedway for race weekends. That’s where we were on June 20, 1992, for a race in the ARCA series, the Goodwrench 200. My dad, Bob Keselowski, was driving in it. I remember everything about that day. Just being there with the crowd. Watching the race from the infield. Playing with other kids. And the end of race, when my dad won. I remember running to Victory Lane after it was over. Honestly, I was more excited when my dad won than I am now when I win. Maybe it was because I was so young. I literally jumped all the way to Victory Lane, running and jumping up and down, and laughing. My dad never did much when he won. I remember him smiling and being proud, maybe drinking some water with a towel around his neck. He was just real quiet and understated. 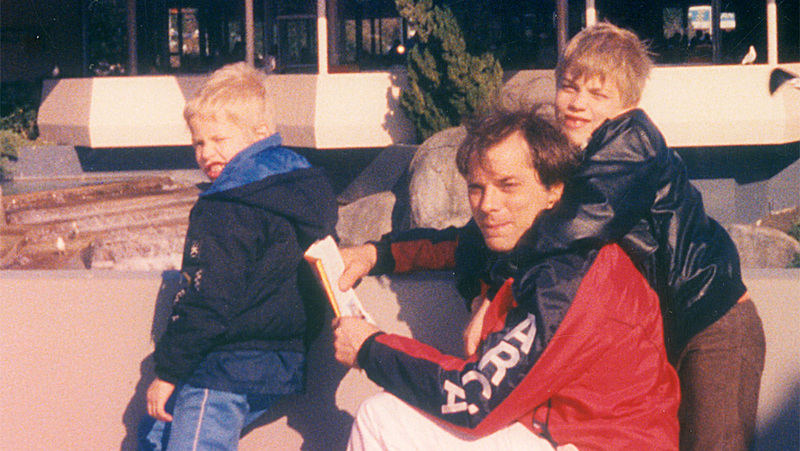 FATHER’S DAY, 1992. WE WERE WINNERS. For my dad, things began with my grandfather. My grandfather started off racing snowmobiles and motorcycles before he had a really bad accident, sometime around the 1950s. That’s when he switched to NASCAR, which was new at the time. He dedicated his disposable income to stock car racing, eventually becoming something of an owner in the 1960s and 70s. Then my dad and his brother, Ron, followed suit. When my dad became a driver, he chose the No. 29 as his number — a number we still use at Brad Keselowski Racing on our truck team — because that’s how old he was when he first got behind the wheel. Michigan isn’t really a hotspot for racing. It’s popular, but it’s not like it is in the South. I know that might be hard for people to understand since Detroit is the home of the automobile, but Detroit is very much a stick and ball sport town. It’s not really a racing town. And because of that, it was always a struggle for my family when I was growing up. My dad was trying to make enough to have a middle class living. He was very dedicated. Racing was all he did. A few times, things got really desperate, and he would help other people with their race cars. But for the most part, he raced for himself, and for us as a family to raise money to live off of. To me, as a kid, my dad was Dale Earnhardt. Racing became the only thing I knew. I grew up on the road watching my dad race when I could, or being away from him and staying with my mom, or a grandma, or aunt, or whoever would watch me. So that’s how I got into racing. 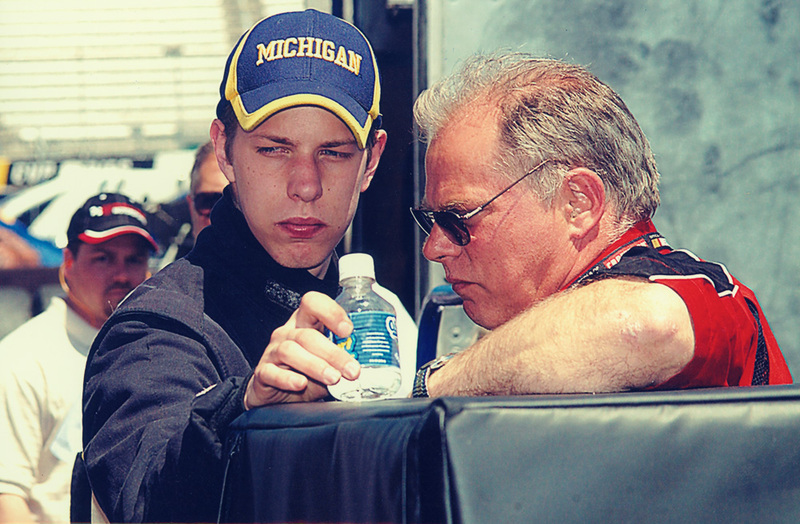 It was from my dad, and that’s probably one of the biggest gifts he gave me: an education in racing. It wasn’t the easiest life. There were some hard days, though as a kid, I didn’t realize them when they were happening, really. There were some times when we’d have a fried egg and a glass of water for dinner because it was the cheapest thing we could have. In some of the really tough years, on the first day of school, we’d have a single outfit, and we’d wear it for three or four days in a row. It was the way it was. I also saw, up close, just how hard it could be for my dad. Sometimes, he’d wreck his car — his only car — on a Thursday, but have a race scheduled on Saturday. His answer? “We’re going to drive to Oklahoma, buy one and drive back the next day.” And when he said buy one, he wasn’t talking about a car that was put together. He and my uncle would work on it day and night, and have it ready to race. Other days, he’d get done done working around six or seven o’clock on a race car, and come back home around 7:30 or eight to eat dinner with us as a family. Later that night, after we’d gone to bed, he’d be up reading books about how to be better. He studied. He was 100 percent focused and committed. That always stood out to me. ME, DAD AND MY BROTHER, BRIAN. TO ME, AS A KID, MY DAD WAS DALE EARNHARDT. My dad had some success. He was the 1989 ARCA champion, and his 24 wins in the series still tie him for 8th all-time. By 2003, he had a fully sponsored truck team with a dozen employees, and driver named Terry Cook. I was working on the team, too. We had won a bunch of races the year before, and things looked promising for the season. In March, we were at the testing grounds in Romeo, Michigan, a place that’s probably most famous for being the hometown of Kid Rock. We were in the middle of testing. He was standing right next to me, there on the track. We were working through some test plans in preparation for the next race. A second later, he was on the ground. It was some kind of blood clot, and it affected his heart and his brain. His face turned every color you can imagine, and then, for what seemed like two or three minutes, he was dead. By the grace of God, the track personnel had a defibrillator. A team guy named Jeff who’s now with the No. 43 team in the Cup Series knew CPR. They brought him back to life. My dad spent the next couple weeks in the hospital in a coma. Even though they’d been able to save him, some damage had been done. From there, everything in our lives started to unravel. While my dad recovered, my mom and uncle hired someone to stand-in for him. That didn’t work at all. About six months later, my dad started to get better, but he still wasn’t capable of running the team. By the end of the year, we’d lost pretty much all our employees. In 2004, with a skeleton crew, I took over driving for the team. I ran about eight races before we went completely broke. We took on a funded driver who brought money with him, and that was enough to help us kind of recoup financially and get on our feet. I sat on the sidelines for the next six months. His face turned every color you can imagine, and then, for what seemed like two or three minutes, he was dead. Then the next season started. We thought we had a sponsor in 2005, so I got back in the truck, and ran the whole season. It turned out the sponsor was doing all kinds of shady financial things the whole year. They took all the team’s money, leaving my parents with huge bills and no way to pay them. They had to go into bankruptcy and sell everything off. For me, it was devastating. I hadn’t caused the end of the family racing team, but I didn’t save it, either. It was like watching someone falling off a cliff. You didn’t push them off the cliff. They were already falling. But you reached out to grab their hand and you missed, and that person fell and died. Would you feel responsible? Absolutely. For my dad, it was crushing. He’d had his racing team for two decades and lost it. He’d almost died. And right around the same time, his mother also passed away. It was overwhelming on all fronts. Between being in a financial situation where you can’t afford to really do anything, to owing your friends money, which is never fun trying to explain — as you can imagine, events like that can threaten to tear your family apart. If you ask my dad about everything that happened during that time, he’ll tell you it was a blessing. If I had taken over the family business, run it the way I wanted it to, and found the funding that I was looking for, most likely I would still be in Michigan, running a truck team. I probably would have never made it to the Cup Series, or been a Cup Champion. As my dad likes to put it, God had a bigger plan. My dad has never said much to me about my career. He’s from another generation. He doesn’t talk with me about my successes or how he feels about them (though he won’t hesitate to point out something I need to work on). He keeps that stuff to himself. In that way, we’re kind of similar. Anyone reading this will find what I’m about to say hard to believe, but it’s the truth. In social settings, we’re usually the quietest ones in the room. I like to listen a lot, kind of keep to myself and observe a situation. He’s like that, too. My dad is very humble. He always has been. When he had money to buy a brand new pickup truck and he had a beat up one, he didn’t buy one. He just didn’t feel like he needed it. He only bought and used what he needed. That’s just the way my dad is. Racing is very difficult. There’s a reason why most drivers aren’t in their prime until their 30s. You definitely do get smarter, but it’s mostly because of experience. Tracks, cars, situations — you learn about all of these things by studying them. In part, that’s why you often see second and third generation drivers emerge in NASCAR. They had that education, whether they knew it or not, from a very early age. My dad certainly gave that to me. I wouldn’t be where I am today without him. There’s no question in my mind about that. ASK MY DAD ABOUT EVERYTHING THAT HAPPENED DURING THAT TIME, AND HE’LL TELL YOU IT WAS A BLESSING. Still, even though I’ve won a championship and had the success I’ve had, I still look at him in amazement. I wonder if I could do the things he did. 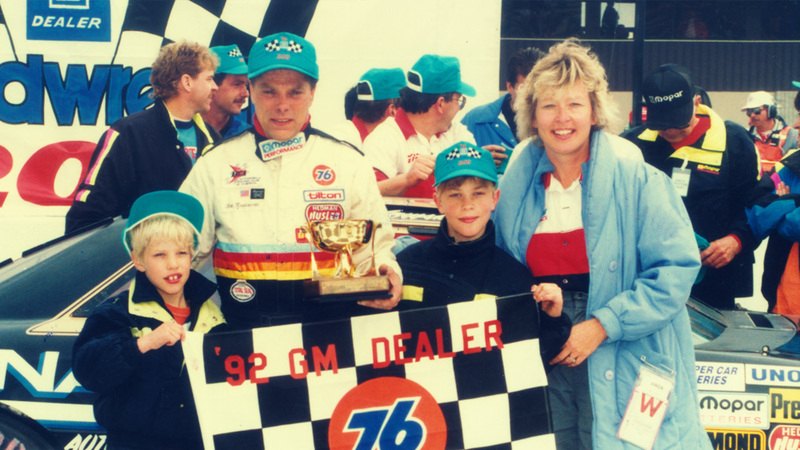 He raised a family, and ran a racing team with no money and no support in much leaner times. The 1980s and 90s were kind of dark ages for racing. People back then were racing in a much less safe environment — I think of him driving without a HANS device or a SAFER barrier. That can’t be understated. They were racing for a lot less money and a lot less fame. They were racing just to eat. I don’t know how he did it. I really don’t, and I don’t think I could. I look at the challenges he dealt with, and I think to myself that what he accomplished in the face of all that adversity is more than I’ve done, or ever will. The quiet dad, the strong dad – takes care of us without much and teaches us by example. We were so lucky to be blessed with our dads! Thanks for sharing Brad. Your father is a special person and so are you. Met your family at the Illinois state fair, Duquoin, and during a visit to Michigan to see our cousins, Jesse and Rose Wright. Went to the garage, a lot of trophies, but everybody more interested in the “car”.. I learned to love racing as a kid and had a blast watching him win the fair race! Keep up the good work, you’re fun to watch!